Ever since its inception in 1905, the annual Geneva International Motor Show has been one of the most important events for the global automobile industry. And while manufacturers’ increasing unwillingness to invest in big set-piece events has affected a number of long-established motor shows – for instance, last year’s Paris show was missing many key players and Frankfurt’s event before that also had an impressive list of no-shows – Geneva is still attractive for the big auto brands. As Switzerland is traditionally a neutral territory and lacks an auto industry of its own, its show is more international than those in Germany and France, which attract mainly manufacturers from their own countries. It also focuses heavily on innovation and is regarded as a level playing field for the global car brands, which in turn makes it more interesting for the media. This March, Geneva attracted 602,000 visitors and had 151 world and European debuts, nearly half of which were electric or hybrid vehicles. Indeed, electrification was the main theme in the conversation around the show, with manufacturers and industry analysists being in a general consensus that electric mobility is the future. The rush for an industry transition comes at a time of slow sales, an ongoing US-China trade war, Brexit, and, most importantly, new European emissions regulations, which will come into force next year and will compel car firms to minimise the emissions of carbon dioxide. As a whole, the industry braces itself for tighter standards for petrol and diesel vehicles as policy makers become more anxious to take action on environmental issues. The media discussion around this year’s Geneva Motor Show proved to be lively, with many high-profile daily, business and industry publications covering the event. We analysed a wide range of English-language publications to find the most prominent brands in the conversation. Mercedes and Audi dominated the media discussion with their new electric projects. Mercedes, which said it was investing 10 billion euros ($11 billion) to develop electric vehicles and build a new global battery production network, introduced its new EQV concept car – a model defined as the first pure electric MPV in luxury cars. The company also premiered the EQ Silver Arrow 01’s, its first pure electric racing model. Audi launched its new pure electric concept Q4 e-tron, which is expected to be put into mass production by the end of next year. The brand, part of the Volkswagen Group, also unveiled four pure electric models and four plug-in hybrids, saying it will fully expand its electrification strategy with 12 models by 2025 when its EVs are projected to account for one-third of its global sales. Volkswagen, the flagship brand of Volkswagen Group, unveiled an all-terrain waterproof electric concept model ID.BUGGY, and said it wants to have 10 electric models by 2025. Another brand of the same group – Porsche – introduced its own electric sports car, the Taycan, and shared plans to have three BEVs by 2021. Meanwhile, BMW exhibited an electrified medley crew ranging from sedans to SUVs. Some brands attracted attention not with electric models but with new stellar designs – for instance, Ferrari showcased its new mid-engined F8 Tributo, and Volkswagen Group’s brand Bugatti hit the headlines for offering the world’s most expensive new car – La Voiture Noire – which was sold to an anonymous buyer for at least $11m, beating the previous new car record of about £8-9m for a Rolls-Royce Sweptail. While industry publications reviewed individual models, daily outlets put the show in different economic and political contexts: for instance, Reuters focused on Brexit, the BBC – on the new regulatory climate and CNBC – on the US-China trade war. To identify the most influential brands in the media conversation around the event, we used our Influencer Network Analysis (INA) methodology, which employs natural language processing, entity extraction, free-text data mining and dynamic network mapping technology, complemented by human-led analysis. The following map visualises the relationship between the brands driving the conversation and the media outlets that referenced them most often – in this case, at least four times. 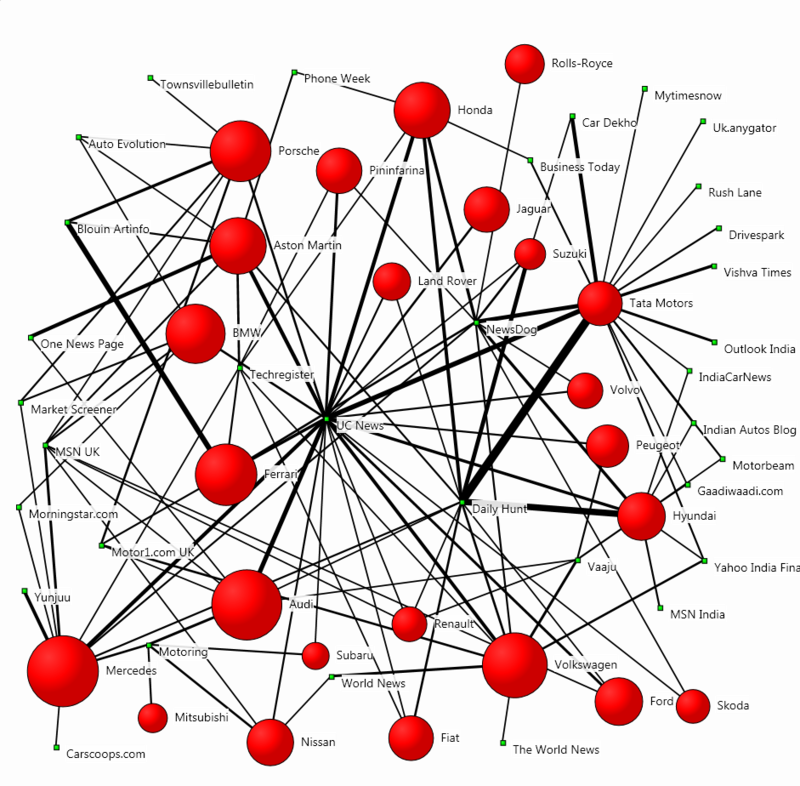 The size of the red circles indicates the brands’ prominence in the media discussion, and the width of the connections between the brands and the publications is indicative of the coverage volume. Audi enjoyed the greatest centrality in the conversation, followed by Mercedes, Volkswagen and BMW – all brands which introduced new electric models. They featured prominently in the most central outlet, the news aggregator UC News, which published articles such as: “Coolest electric cars of Geneva Motor Show 2019”, “Supercar fantasies at the Geneva Motor Show” and “Geneva Motor Show: Stunning Concept Cars Give A Peek into Future”. The companies were also the focus of other news aggregators like Daily Hunt and News Dog. Indian auto giant Tata Motors, which also showcased its new electric model at the show, owes its centrality to the large number of Indian publications such as India Car News and Indian Autos Blog, which also focused on South Korean manufacturer Hyundai. Italian car design firm Pininfarina, which has spent 90 years designing vehicles for the likes of Ferrari, Alfa Romeo and Peugeot, revealed its first car, which it called ‘the world’s first pure electric luxury hyper GT’. Michael Perschke, the firm’s chief executive, said: “Electrification unlocks the door to a new level of performance and a zero-emissions future, whilst a passion and respect for automotive history will define how this landmark car looks and feels.”This electric debut managed to make the firm an influential participant in the media conversation. Jaguar and Land Rover were mentioned as notable no-shows, alongside Ford and Volvo. Journalists suggested that Jaguar Land Rover, the holding company of the Jaguar and Land Rover marques, didn’t take part in the show as part of its plan to cut costs and improve cash flows at a time of Brexit uncertainty, tariff threats, a market slowdown in China. Ford, on the other hand, asserted that it didn’t have the time to participate, while Volvo said that it will concentrate on hosting its own events. Tesla, whose Model 3 was the best-selling electric car in the world in 2018, has a similar marketing strategy of hosting its own shows. Most car manufacturers think that the next 10 years will bring more change than the two previous decades and that by 2025, the automotive industry will be dramatically different. By that time, electrics and hybrids are expected to account for 30% of all car sales, compared to just 1% in 2016. This growth is driven by the increasing market attractiveness of EVs, which is influenced by both market-specific (typically governmental regulations and subsidies) and non-market-specific (e.g. battery range) factors, according to Accenture’s Electric Vehicle Market Attractiveness study. The degree to which the purchase of an EV instead of a conventional car is perceived as a more attractive option is also influenced by specific communication initiatives. Such efforts come mainly from government bodies – for instance, UK’s Department for Transport launched a strategy called ‘The Road to Zero’ in a bid to change the culture of car ownership towards electric cars. The Department’s ongoing Go Ultra Low marketing campaign is supported by Audi, Citroen, Hyundai, Kia, Mercedes-Benz, Nissan, Peugeot, Renault, Tesla, Toyota and Volkswagen, strives to raise awareness about the benefits of electric cars and dispel some misunderstandings, since 89% of British drivers don’t know that electric cars accelerate quicker and 42% aren’t sure if electric cars could go through a car wash. Similar communication initiatives, which aim to adapt consumer attitudes to upcoming regulatory changes, intensify the media discussion around EVs. And while events such as the Geneva Motor Show allow car manufacturers to showcase their electric prowess, they need more consistent marketing strategies which would put their brands at the forefront of the conversation more than once a year. For more EV insights, take a look at Electric Vehicles in Online Media – Rapid Expansion Amidst an Uncertain Future.